Windows were cleaned inside and out! Give the new bocce ball courts a try! The month of November is widely known as a time of thanksgiving and gratitude. SunBird has many veterans living here and/or have family members who served, or have passed on and/or family members currently serving. We will be honoring all service persons on November 11 in the Ballroom at our Veterans Day program. Without the many sacrifices of our service people, we would not have the freedoms and luxuries of life we enjoy each day. Let’s show gratitude to our veterans and be thankful for what we have. Thank you for your service. The weather is terrific and SunBird is at full throttle with activity. Golfing, tennis, swimming, shuffle board, horseshoes pickleball, bocce ball, billiards, exercise activities and much more. What a sight to see all residents living life to the fullest with all the amenities SunBird has to offer. 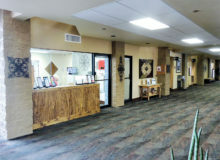 If any of these are not your thing, come up to the Clubhouse and check out the books in the library, play a game of cards or join one of the many art classes to learn and do something fun. We have something for everyone. With the threat of monsoon storms behind us now and all the mess they can create, the Clubhouse received its annual fall cleaning. The size of the Clubhouse is 43,000 square with three levels and over 100 windows. A contractor was hired to power wash the entire exterior building and clean all the windows inside and out. The carpets and flooring were also shampooed and cleaned throughout the Clubhouse. With the several various improvements made throughout this summer the Clubhouse is looking great! The installation of the brand new bocce ball courts have been completed. This past summer the community voted to install two permanent bocce ball courts with a concrete base and fine quality artificial grass sport turf. 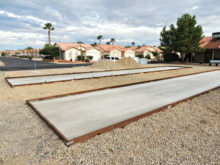 These new bocce ball courts look fantastic and were a needed addition to the many SunBird recreational facilities offered here. Bocce ball is fun game that most people learn to play fairly quickly for all ages. To join a bocce ball league or start your own team stop by the office for assistance. SunBird has several awesome committees, clubs, organizations and people who do so much for the improvement and betterment of SunBird. The SunBird Lion’s Club recently donated funds for Clubhouse improvements that went towards the cost of installing handicap assisted door operators for the restrooms on the third level of the clubhouse. SunBird Kare Bears donated funds for additional chairs for the Ballroom and additional cameras. The SunBird Garden Club has made so many nice landscaping plant, rock and flower pot donations around the clubhouse and the club even maintains them. Not to mention the many individual volunteers who help with all of the various projects like recovering chairs, painting and with other work. We thank you for your time, talent and service to SunBird. One of the Board of Director goals this year is to create greater safety and emergency awareness at the Clubhouse. A Clubhouse emergency location map was developed indicating where all emergency telephones, first aid kits, fire extinguishers, AED units and other safety devices can be found in a crisis. Last month the City of Chandler Fire Department offered training to employees and some residents for CPR, AED and first aid certification. If anyone is interested in more information about training or Clubhouse safety, please contact the SunBird office. SunBird has about 12 miles of privately owned roads within that curve and are sometimes narrow without sidewalks next to them. Recently in some of the high traffic road areas around the Clubhouse and other intersections, stop and slow down signs have been painted directly on the ground to help remind people to stop and slow down. 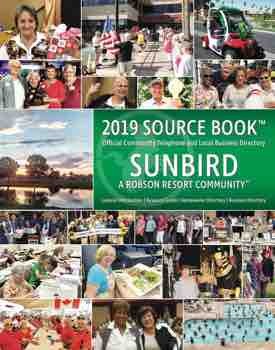 SunBird has lots of activity in the roads with pedestrians, bicyclists, golf carts and vehicles. Let’s be conscious of the traffic rules and be extra careful when driving to keep SunBird a safe place to enjoy. Have a wonderful Veteran’s Day and a Happy Thanksgiving!